Welcome to the N Gauge Forum - the number 1 forum for the N gauge community! We have plenty of resources to help including a Wiki, tutorials, resource bank and also a Classifieds system where our members can buy and sell items amongst themselves. Our strength is in our members, who are only too happy to share their experiences, good and bad, and freely provide friendly help and advice. Our forum has grown over the years and we now have members from all around the world and at all levels of experience. 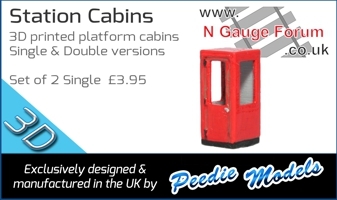 So if you are contemplating starting N gauge modelling or are an experienced modeller, then there is a place for you! Remember to abide by our Code of Conduct, and also remember that this is considered a family forum.